Shirlane Hendrickson from Trinidad & Tobago has been singing professionally since 1990. She started singing calypso at the age of 6 alongside her famous father, calypsonian Allrounder. 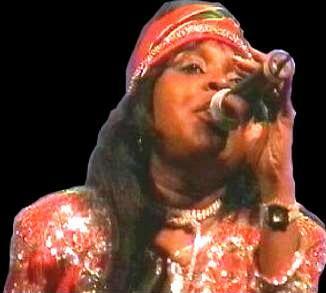 Shirlane is four times crowned NWAC National Calypso Queen of Trinidad & Tobago in 1998, 1999, 2000 and 2001. Shirlane has performed with many international entertainers, including Mighty Sparrow, Kitchener, Calypso Rose, Arrow, Mary Isaacs and Rita Marley. Her 1998 and 1999 World Tour took Shirlane through Orlando, Miami, Jamaica, Japan and West Africa. Soca Rebels was contacted by Norrköping Carnival in the year 2000 because of Shirlane Hendrickson, National Calypso Queen of Trinidad & Tobago, was supposed to perform at the carnival. A suggestion that Shirlane and Soca Rebels performing together came up. As Lars Hansson was in Trinidad that time he picked up Shirlane’s music from her sister Dianne Hendrickson Jones (Lady Wonder). Back in Sweden a quick rehearsal was done with the band and Soca Rebels travelled up Sweden to Norrköping. One hour before the concert Soca Rebels met Shirlane Hendrickson for the first time and without any rehearsal went on stage to perform. The concert was recorded directly down to stereo without overdubs and was released on the album Raw Soca. The year after when Shirlane came back to perform at Norrköping carnival she requested Soca Rebels to back her at the concert.